KNR University of Health Sciences, Warangal, Telangana State hereby notify that the first and final verification of certificates for Web Based Counseling will be conducted for Admissions into BAMS / BHMS / BNYS Courses in Colleges under KNR University of Health Sciences, Warangal, Telangana State. The candidates whose names have been notified in the provisional merit list are directed to attend 1st & Final verification of certificates for admission into BAMS / BHMS / BNYS Courses for the academic year 2018-18 into the Colleges in Telangana State affiliated to KNR UHS at Help line Center Prof. RamI Reddy Center for Distance Education, OU Campus, ( PGRRCDE) Hyderabad as per the schedule given below. 8.30 A.M. 1801 to 2000 certificates. SPECIAL CATEGORY CANDIDATES CERTIFICATE VERIFICATION (PH / NCC & CAP) VENUE: JNTUH KUKATPALLY, HYDERABAD ONLY FOR BAMS / BHMS / BNYS OF EAMCET-I. * Note: Special category seats will be allotted as per Govt. rules in force. * Note : The eligible candidates are advised to attend for verification of Original Certificates at the specified Help-line centers as per above schedule, subject to fulfillment of above conditions. The guidelines of Govt. of India and regulations of Medical Council of India shall be observed in making admissions of differently abled (Physically Handicapped) candidates, according to which the Physically Handicapped candidates with locomotory disorder of lower limbs between 50% to 70% will be considered first and candidates with locomotory disorder of lower limbs between 40% to 50% will be considered for remaining unfilled seats. The candidate seeking the benefit of reservation should present him/herself before a Medical Board comprising of at least one Expert/Specialist from the specialty of Orthopedics and one specialist from Department of Medicine of the rank of Professor constituted by KNR UHS, Warangal. The Medical Board constituted by the Competent Authority will examine and assess the percentage of disability of differently abled candidates, who have applied seeking admission under PH quota. The report of the Medical Board is final for considering a candidate under PH quota as per rules. 1. The candidate should be Indian Nationals or Persons of Indian Origin (PIO) / Overseas Citizens of India (OCI) Card Holders should satisfy the Local or Non-local status in Andhra Pradesh and Telangana (Residence requirement) as laid down in Andhra Pradesh Education Institutions (Regulations of Admissions) Order, 1974 and the selection will be done as per the procedure laid down in the G.O.P.No.646, dated 10.07.1979 as amended in G.O.Ms.No.42, Higher Education Department, dated 18.05.2009 and G.O.Ms.No.170 HM&FW Dept. Dated: . 2. The candidate should have qualified in NEET UG 2018 and must have applied on-line and should be in the provisional merit list for admission into BAMS/BHMS/BNYS Course . 3. The candidate should have completed 17 years of age as on 31-12-2018 for all courses. 1. The candidate should be Indian Nationals or Persons of Indian Origin (PIO) / Overseas Citizens of India (OCI) Card Holders should satisfy the Local or Non-local status in Andhra Pradesh and Telangana (Residence requirement) as laid down in Andhra Pradesh Education Institutions (Regulations of Admissions) Order, 1974 and the selection will be done as per the procedure laid down in the G.O.P.No.646, dated 10.07.1979 as amended in G.O.Ms.No.42, Higher Education Department, dated 18.05.2009. The candidates are directed to bring all the original certificates (mentioned below) and two sets of self attested Xerox copies. 9 Permanent Caste Certificate (Integrated Community Certificate) claiming reservation under BC/SC/ST Categories issued by an Officer prescribed. 10 Self Attested copy of Aadhaar Card of candidate and Father and Ration Card. Candidates whose names are in the final merit list to be displayed on KNRUHS web-site on 23-09-2018, can exercise web-options from 9.00 A.M. on 24-09-2018 to 5.00 P.M. on 25-09-2018..
1.The details of seats available in various colleges (both Govt. 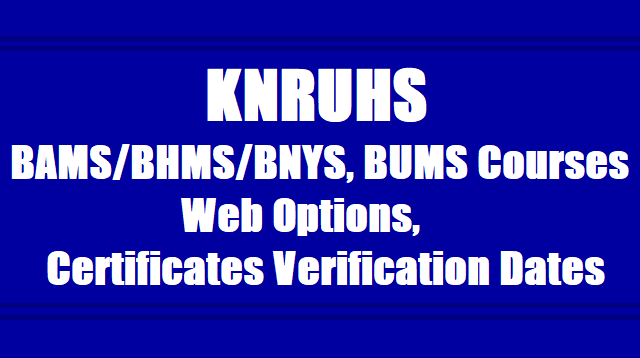 and Private) to exercise web options for admission into BAMS / BHMS / BNYS courses will be notified on website (www.knruhs.in) (http://tsbahnu.tsche.in.). 2. Candidates are hereby informed that, this is the first and final phase of verification of certificates. No further verification of certificates will be done. Candidates who got their original certificates verified only are permitted to exercise their web options in the subsequent phases if any subject to their eligibility. 3. Candidates are advised to opt for seats in courses and colleges in which they are interested to join. If they are not interested to join, they should not give options and provide opportunity for the next meritorious interested candidates. 4. Therefore, if a candidate gives options and is allotted a seat and if the candidate does not join, the candidates options will not be considered for that course in subsequent phases of counseling. 5. Candidates can give options on the web either from helpline centre / home / any other place having internet facility with Internet explorer 11 version. 6. Candidates opting for BAMS / BHMS / BNYS courses are advised to exercise options after certificate verification as per the schedule from 3.00 P.M. on 6th to 3.00 PM. on 8th October, 2018. 7. Next round of counseling (for exercising options) for left over seats in phase-I and not reported seats and new seats sanctioned in existing colleges or new Colleges sanctioned, if any, will be conducted.